TPR has now entered into a relationship with the Association for Behavior Analysis International and Springer Science+Business Media. You can join ABAI to receive significant discounts on journal subscriptions and many other member benefits. ABAI members can subscribe here. Nonmembers of ABAI, libraries, and other institutions wishing to subscribe or renew subscriptions should contact subscriptions@springer.com. For more information about the journal, visit TPR by clicking this link. Before submission, review the "instructions for authors", then click here to submit your work. The Psychological Record is pleased to announce that articles published in the journal from 2002 – 2011 are now available online at: http://opensiuc.lib.siu.edu/tpr/. 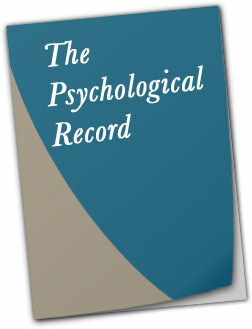 The Psychological Record is a quarterly journal of psychology. The journal was founded by renowned interbehaviorist, J.R. Kantor, with one of the most influential American psychologists, B.F. Skinner, serving as the experimental department editor at the journal’s inception. Since 1937, the journal has published psychological theory and research concerned with a broad range of scientific topics in the discipline. All manuscripts are reviewed with respect to their scholarly merit. The journal hopes to stimulate creative and innovative research by both newer and seasoned researchers from many areas of the world. Time from submission to receipt of editorial feedback averages approximately 2 months, and time from official acceptance to printing averages approximately 9-12 months.